Structure from Motion with Multi View Stereo provides hyperscale landform models using images acquired from standard compact cameras and a network of ground control points. The technique is not limited in temporal frequency and can provide point cloud data comparable in density and accuracy to those generated by terrestrial and airborne laser scanning at a fraction of the cost. It therefore offers exciting opportunities to characterise surface topography in unprecedented detail and, with multi-temporal data, to detect elevation, position and volumetric changes that are symptomatic of earth surface processes. This book firstly places Structure from Motion in the context of other digital surveying methods and details the Structure from Motion workflow including available software packages and assessments of uncertainty and accuracy. 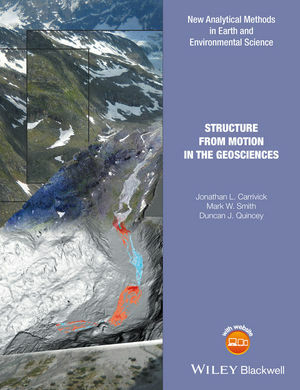 It then critically reviews current usage of Structure from Motion in the geosciences, provides a synthesis of recent validation studies and looks to the future by highlighting opportunities arising from developments in allied disciplines. This book will appeal to academics, students and industry professionals because it balances technical knowledge of the Structure from Motion workflow with practical guidelines for image acquisition, image processing and data quality assessment and includes case studies that have been contributed by experts from around the world. Jonathan Carrivick is a Senior Lecturer in Geomorphology in the School of Geography, University of Leeds, UK. His primary research interests lie within polar, arctic and alpine ice-marginal systems, and especially focus on glacier outburst floods and proglacial lakes. He specialises in digital topographic surveying, especially for construction of terrain models for input to morphodynamic computer simulations, and for detecting rapid geomorphological changes and geomorphological coupling in glaciers, alpine hillslopes, moraines and gravel bed and bedrock rivers. Dr Mark Smith is a Lecturer in Water Research in the School of Geography, University of Leeds, UK. His research focuses on the interactions of rough surfaces with air and water flows and methods of quantifying that roughness, with particular application to fluvial hydraulics, sediment transport and surface energy balances. He is a specialist in high resolution survey methods having worked with Terrestrial Laser Scanners for over a decade and more recently using Structure-from-Motion datasets in a range of environments, from gravel bed rivers, to eroding badlands to melting glacier ice. Dr Duncan Quincey is an Associate Professor in Geomorphology in the School of Geography, University of Leeds, UK. His research focuses on the evolution of glacial and alpine environments, with particular interests in the processes controlling lake development and outburst flooding. He is a remote sensing specialist with skills in developing optical- and SAR-based methods for retrieving surface velocity data from satellite imagery and in employing novel remote sensing methods, such as Structure-from-Motion, to data model geophysical processes. 1.4. What is Structure from Motion? Chapter 2: The place of Structure from Motion: a new paradigm in topographic surveying?